I love working with a fun bridal party that doesn't take their wedding photos too seriously. Sometimes a bit of goofing off goes a long way to creating a more dynamic image that gives the viewer lots of different expressions to look at. 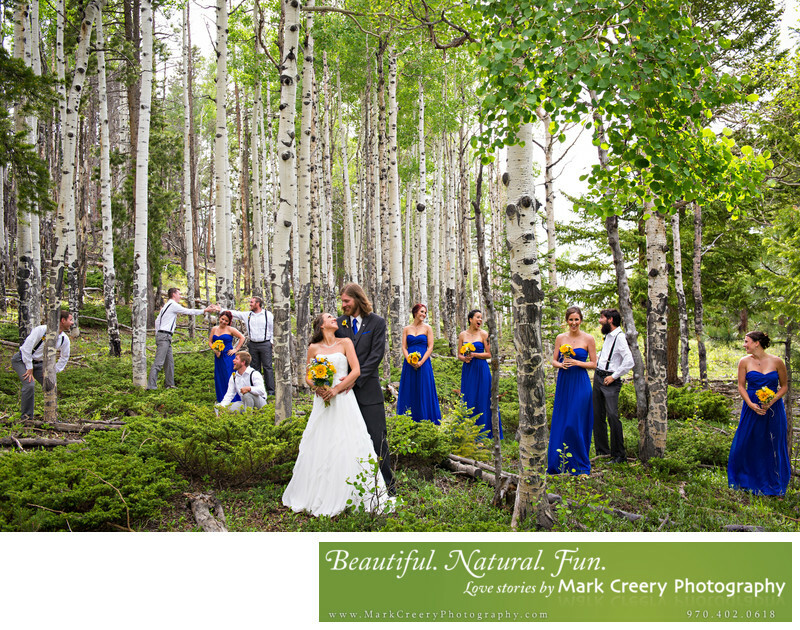 In this photo taken in Vail up among the aspens, the bridal party spread out into the trees and then interacted with each other in a variety of ways. The couple just looks at each other thinking about what goofs their friends are, in a loving sense of the word of course. If you're trying to find a wedding photographer in the Vail Valley I love photographing there and can show off the venue and scenery you've chosen while still focusing on your personalities. If you're still searching for your venue in Vail, many great venue options abound. I can't say I recommend one over the other, since each location is unique just like your wedding and personalities. Venues include Saddle Ridge, Beano’s Cabin, Toscanini, Allie’s Cabin, the Beaver Creek wedding deck, Spruce Saddle, Donovan Pavilion, Tivoli Lodge, and the Park Hyatt.